$40.00 "A Drop of Ilych's Blood" one-page propaganda broadsheet, circa 1925-26, featuring a Russian language poem about Lenin. Published by the Leningrad Gublit. $60.00 "Semyon Konstantinovich Timoshenko", A Short Biography, Military Publishing House, Moscow, 1940, 15pp, hand-tipped halftone portrait frontispiece, Russian text, hard covered pamphlet. Library discard: shows stamp of the Red Army Archives dated 1946 plus library stamps. $50.00 "Calendar for 1930", published by the Knigospilka ("Book Society" or Cooperative Cultural Center), in Ukrainian. $75.00 " Recruitment for the Red Army," Publishing House of the Narkomat of the Army and Navy (Narkomvoenmor) and Revolutionary Military Council (RVS), Moscow, 1926, 292 pp, Russian text, hard cover. Published by the "RKKA Headquarters. Agency for Research and Application of the War Experiences". See additional Red Army instruction books of WW2 era in the "WW2 Soviet Military Manuals" section of our website. $95.00 "Leningrad", 24pp bi-weekly magazine of the Leningrad Chapter of the Union of Soviet Writers, Russian text, combined issue #13-14, July 1941. See wartime newspapers and information buro communiqués in the "Soviet Newsprint of WW2 Era" section of our website. $170.00 "History of the Civil War in USSR" Volume 3, deluxe edition by the Political Literature State Publishing House, 1957. 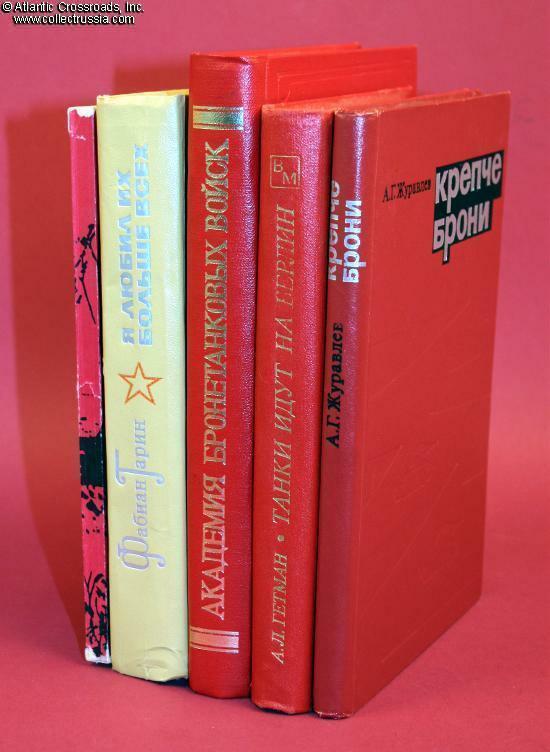 Hard cover, large 9¼" x 11¾" x 1¼" format, Russian text. Contains many b/w photographs and color illustrations, 402 pp. In very good to excellent condition. $160.00 "History of the Civil War in USSR" Volume 4, deluxe edition by the Political Literature State Publishing House, 1959. Hard cover, large 9¼" x 11¾" x 1¼" format, Russian text. Contains many b/w photographs and color illustrations, 444 pp. In very good to excellent condition. $175.00 "Vsyo Vyshe..." ("Higher and Higher..."), subtitled "Aviation March of the Air Forces of the RKKA". Text by Pavel German, music by Yuliy Khait. Published jointly by the OGIZ and MUZGIZ Publishing Houses, Moscow, 1933. Constructivist cover design. $95.00 "Anthem of the Party of Bolsheviks", Music by A. Aleksandrov, text by V. Lebedev-Kumach, Muzgiz Publishing House (State Musical Publishing), Moscow, Russian text, unpaginated, 1941. For mixed or male chorus accompanied by piano. $160.00 "Budyonny", Music by D. Pokrass, Moscow, Russian text, 4pp., 1928. A march for piano music in two hands; contains two versions, one of medium complexity and an easy one for beginners. $240.00 "Jubilee March", subtitled "Dedicated to K. Voroshilov", Song and music by famous Russian composer M. M. Ipplitov-Ivanov. Joint publication by OGIZ and MUZGIZ Publishing Houses, Moscow, 11 pp., 1936.